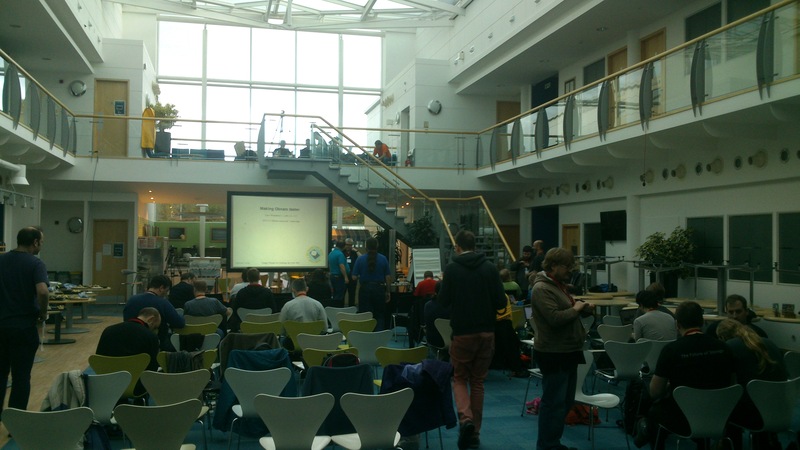 I spent last weekend at the Debian Mini-debconf in Cambridge, UK. What on earth is a mini-debconf? It’s a smaller version of a Debconf, which in turn is a conference concerning the Debian operating system. The Debian operating system is free, and is usually based around the Linux kernel. It can run on (almost) anything, from a Raspberry Pi to an IBM mainframe and I frequently work on products which contain it. Though I’ve worked with the Debian software a lot over the years, I had never really taken part in the community. Attending this event was my first chance to do that. It was a great experience. Thanks to sponsorship from ARM, Codethink, Collabora, Cosworth, and Hewlett Packard Enterprise, it was all free, and even lunch was provided. There was an astonishing variety of talks from all sorts of people, covering topics from sleep apnoea to the problems of dealing with the vast quantities of data generated by the Large Hadron Collider. The talk from Betty Dall of HP Enterprise about The Machine was fascinating. HPE are working on a new computer architecture which does away with the traditional divisions between main memory, hard drives, and other types of storage, and replaces them with a vast (like, really enormous, thousands of petabytes) array of memristor memory. She explained some of the challenges of designing and programming such a machine. I was not a little surprised to hear that it will run Debian Linux, just like the little electric car charging points and communication aids I’ve worked on! Also entertaining was Vincent Sanders’s account of the trials and tribulations of maintaining a web browser, NetSurf. The reality of dealing with the world wide web is hideous: so many web pages do terrible, terrible things, standards are rarely properly documented or specified, and best of all, web browsers are never allowed to give up and say ‘this page makes no sense’! The whole team did a great job, ably led by Steve McIntyre, and the event was streamed live by the Debian Video Team, who I even joined as a temporary director and vision mixer for a couple of hours. The talks will eventually be on line in video form at the Debian Meeting Archive. At the end of the event on Sunday evening, Steve announced that the ARM atrium area would need to look like a canteen by the time we left. With no fuss, no persuasion, people just got together and shifted all the tables and chairs. The work was done in no time. I mused as I left that perhaps that’s why free software works. This entry was posted in Uncategorized on November 10, 2015 by martinjonestechnology.